Growing up eating Indian food, it was made sure that I love onions, even if I absolutely abhorred the way it made my breath smell after. It would get worse when I was asked to cut them up for salads and curries. Yes it’s the tears rolling down my eyes which did not by any means make me a fan of the vegetable. But little did I know about its positive effects on ones health. Super Food: Onions haven’t received its due recognition among other vegetables such as carrots and spinach, but they have been scientifically proven to be highly protective towards nerves and cardiovascular system. They enhance the immune function, fight growth of many types of tumors, help promote healthy hormone function and many more. Heart Protection: Onions have proven to exceed the heart protective properties of red wine. They lower cholestrol, inhibit hardening of the arteries, enhances elasticity of blood vessels and helps to maintain healthy blood pressure. Diabetes and Obesity: Onion’s significant blood sugar modifying properties helps in fighting against both, type 2 diabetes and obesity. Also helps with keeping one’s blood sugar level and weight on track. Now that you know about all these various properties, how are you going to use onions in your diet? This past weekend I found a great philly mediterranean pasta salad recipe on “allrecipes” that one can make incorporating onions, grape tomatoes, spinach and shell pasta. It turned out to be yummy and healthy, and it is around 214 calories if eaten in right portion size. 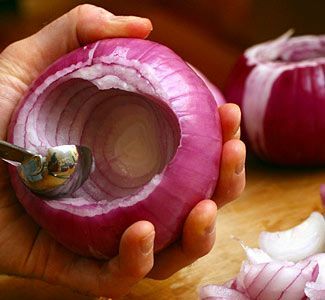 I would love to know what are the other recipes you have which are fun and simple and quite easily incorporate onions.